Standing as a historic and cultural landmark since 1919, Peoples Bank Theatre celebrates A History of Great Entertainment in Marietta, Ohio. Peoples Bank Theatre is creating a new century of stories and memories after reopening its doors in January of 2016. Set in the heart of Marietta’s historic downtown, this once-Vaudeville theatre and silent movie house is today home to concerts, symphonies, theatre productions, and film, as well as community events. Peoples Bank Theatre is easily accessible from Interstate-77, less than 2 miles from exit 1. Turn left on to Putnam Street. Peoples Bank Theatre will be on your left. There are six parking lots within a short distance of the theatre, in addition to on-street parking throughout downtown Marietta. This map shows the location of parking lots available to Peoples Bank Theatre guests for evening events. 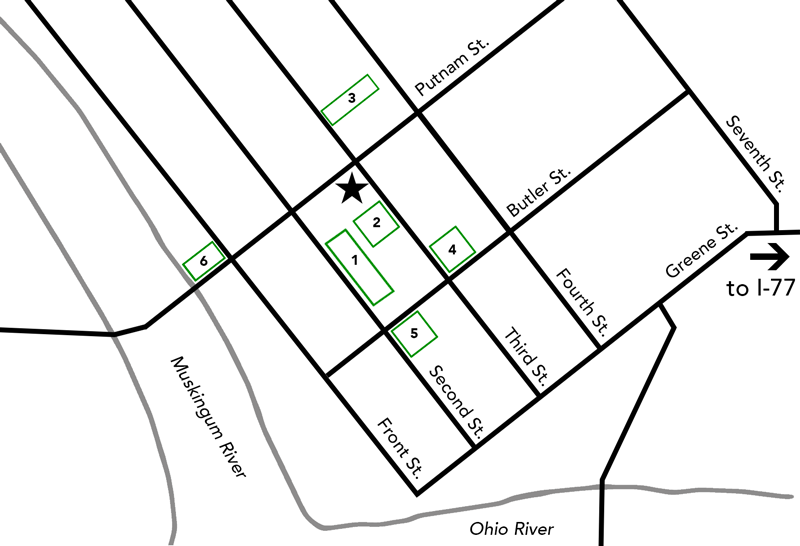 Most are within one block of the theatre, which is located at the corner of Putnam Street and Third Street. Entire floor level with 3 main sections. Seats on house right are evenly numbered consecutively from left to right beginning with seat 2. Center seats are numbered consecutively from right to left beginning with seat 101. Seats on house left are oddly numbered from right to left beginning with seat 1. Row AA extends over row H in the Auditorium. Located immediately behind the Mezzanine, starting with row HH. For more details about seating, ticketing, parking and general theatre information, please visit our Frequently Asked Questions page. Peoples Bank Theatre is fully ADA accessible on the main floor. Sixteen (16) auditorium level seats in have been allocated to patrons in wheelchairs and their companions in Row U. Additionally, nine (9) aisle seats throughout the auditorium level are equipped with movable/folding transfer arms. The theatre is equipped with FM hearing-assist devices, available upon request. Sign language interpreters can be arranged by calling us at 740-373-0894 with at least two weeks notice. Peoples Bank Theatre is located on Putnam Street, in the heart of Marietta, which is full of shops, restaurants, history, and public art… plus gorgeous views along the Ohio and Muskingum rivers. Established in 1788, Marietta was the first permanent settlement in the Northwest Territory, founded by officers of the American Revolution. It is a city of beautiful parks and rivers, 19th century architecture, brick streets, historic landmarks, and museums. We are in the center of one of America’s most robust downtowns alive with shops, restaurants and boutiques. Marietta is the perfect getaway! There is plenty to see and do and places to stay within walking distance of all downtown has to offer. The Visitors Center is just a few blocks from us on Green Street. Stop in for maps, tour information, and more or check out mariettaohio.org to plan your visit and download a visitors guide.